Big Idea: The ocean and humans are inextricably interconnected. The oceans are a connected system of water in motion that transports matter and energy around Earth’s surface. 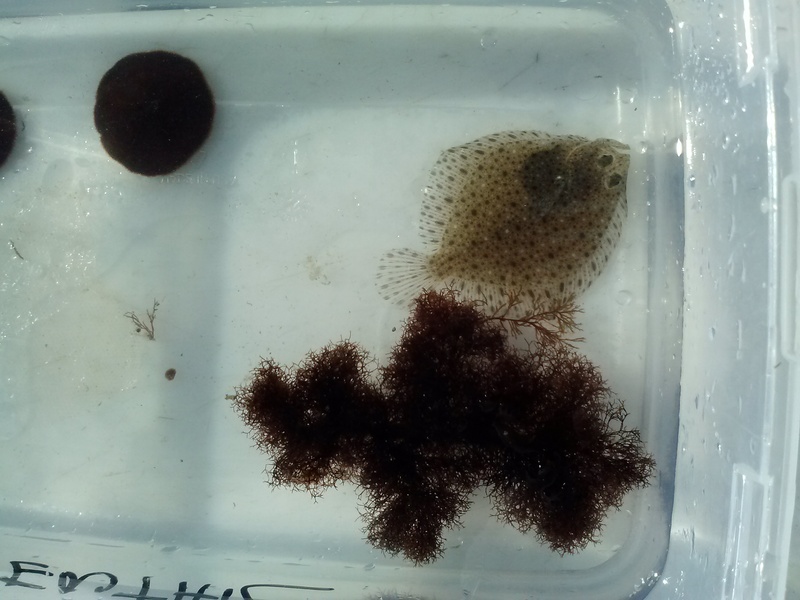 Assignment: In the role of a marine scientist, you will research a marine resource and present an argument for a position related to use of that resource, supporting your position with scientifically valid evidence. Product: On the day of the final exam you will (1) turn in a 3- to 5- page paper, and (2) give a five- to ten-minute oral presentation, with video support, of your research results. To make sure that each student had a separate research topic, I printed the following list in large font and spread them out on the table for students to choose from. Sometimes I assign by putting the topics in a “hat” and students choose blindly, but this is typically followed by a lot of negotiations for swapping; the way I did it this time still had negotiations, but between only those that were quickest with the grab rather than everyone. No perfect way to do this because everyone wants coral reefs. Students were encouraged to narrow down their topics to make them more manageable. For example, “Aquaculture” could be narrowed down to shrimp farming. To make the assignment clear to the students, I broke the description into two pages: the paper and the presentation. 1.Required Length: 1000 words (approximately three pages of text), not including references and not including quoted material. 2. Required references: a minimum of five relevant scientific articles and/or internet sites related to the topic. This is the minimum amount of reference material — you may need more to do an adequate job of researching your topic. define the problem – what part of the world’s ocean does it affect? how did the problem come about? How is the problem being made worse by humans/is it being made worse by humans? What are the various causes of the problem? what are some possible solutions to the problem? Are any of the feasible? How will we implement some of these solutions? what is the importance or significance of the topic? what methods have scientists used to investigate the topic? what kinds of information and data have scientists found? what major results and conclusions have scientists made, based on the above? 5. Submitting your paper: Submit your paper in electronic format, preferably in Microsoft Word or Google doc. 6. Plagiarism: Don’t. Just don’t. You know better. Our school only teaches MLA formatting. With my 18-year background of writing engineering documents, I find it frustrating to constantly be getting english-style essays rather than scientific documents. Starting next year, I plan on teaching my students APA formatting, and directing students to understand the difference between technical writing and english-essay writing. The word length is only 1000 words because I wanted the students focussed on finding good resources and highlighting the issues, rather than being focussed on “getting the right number of words”. In meeting the research requirements most students were concerned that they had gone too far over the minimum. Our librarian has stacks of research record templates in different colors for students to use to document their research, with teachers assigning a different color for the type of resources, e.g., blue for a book, green for technical article, etc.. Our librarian has, for her entire career here, been proactive in helping students to learn the difference between “good” and “bad” resources, to understand what paraphrasing is and isn’t, and to use databases beyond the internet. She teaches all freshmen how to research a topic and has written a research guide for students. You may use the board, posters, handouts, or a PowerPoint presentation to help provide visual aids. Following your presentation, there will be time for a few questions. You should know your topic well enough to answer all reasonable questions on the topic. Grades will be based on both what you present and how well you know the information. If you just read a few paragraphs directly from a sheet of paper or from your slides and cannot answer basic questions on your topic without your notes, you should not expect a passing grade on the presentation. Understand and describe some important properties of water: Before we can understand the numerous and amazing ways the oceans impact our lives on land, we need to understand some special qualities of water. Properties such as surface tension, capillary action and solvency make water one of the most unique substances on Earth. Explain how waves form and shape the coastline. 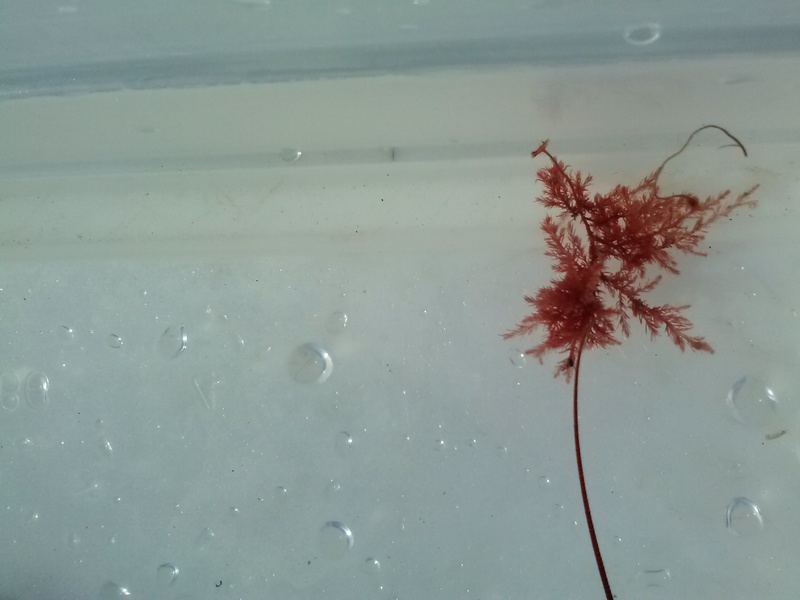 Understanding conditions on the shore will help us understand some ocean habitats. Describe the differences between wave and current formation and qualities. Explain how ocean currents influence climate on land. Describe and identify ocean floor features Understanding the shape of the ocean floor will help us understand ocean habitats. 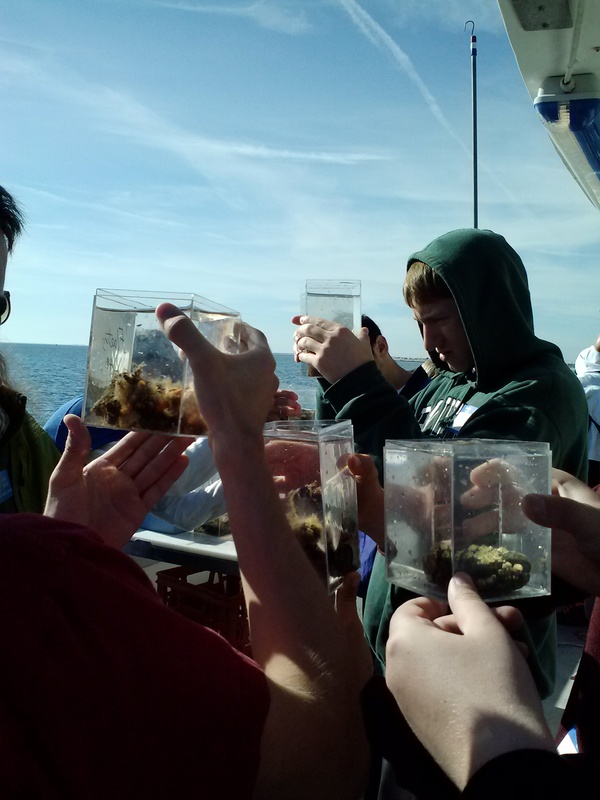 Analyze different ocean zones of life and categorize organisms that live in each. I was inspired by many of the presentations and it gave me the idea that, in my mixed CP/Honors Marine Biology class next semester, the honors students (who will have work in addition to the rest of the class) should give presentations to the CP students. 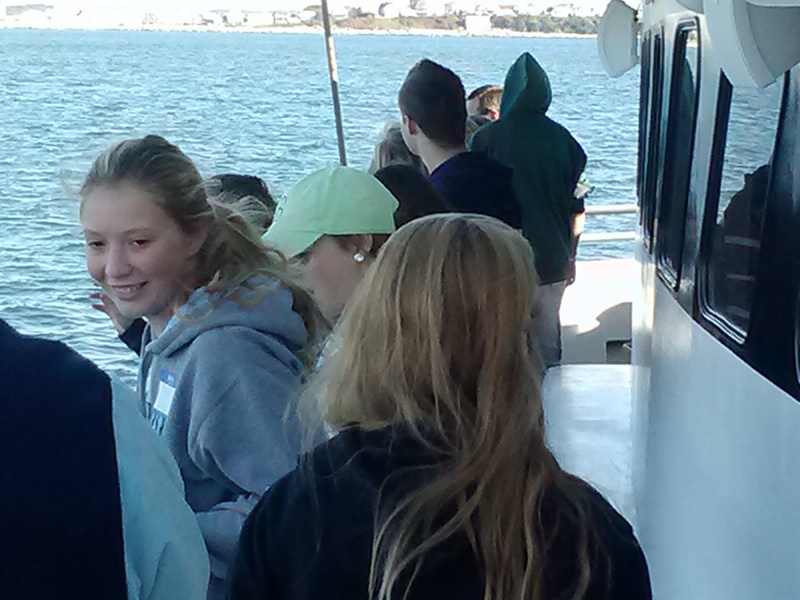 On the field trip you were given a New England Aquarium scavenger hunt booklet to complete. You were also encouraged to take photographs. Now it is time to share your learning with others, through your blog post. Your post must answer all the components of your booklet, as illustrated and outlined below. We can describe “sustainable resources” as renewable resources which are being economically exploited (used) in such a way that they will not diminish or run out. People want or need to use the ocean’s resources but a balance must be maintained to ensure that they will be there for the future. What role does the marine wildlife and nature play in your life? How does the use of marine resources impact you on a personal level? Specifically, what new thoughts do you have about marine resources and the way they are used by people? Finally, what Code of Ethics will you take to protect marine resources both now and in the future? a picture that provides applicable visual interest is embedded, with a citation to the original source. Students were grouped into five groups and rotated through the stations. 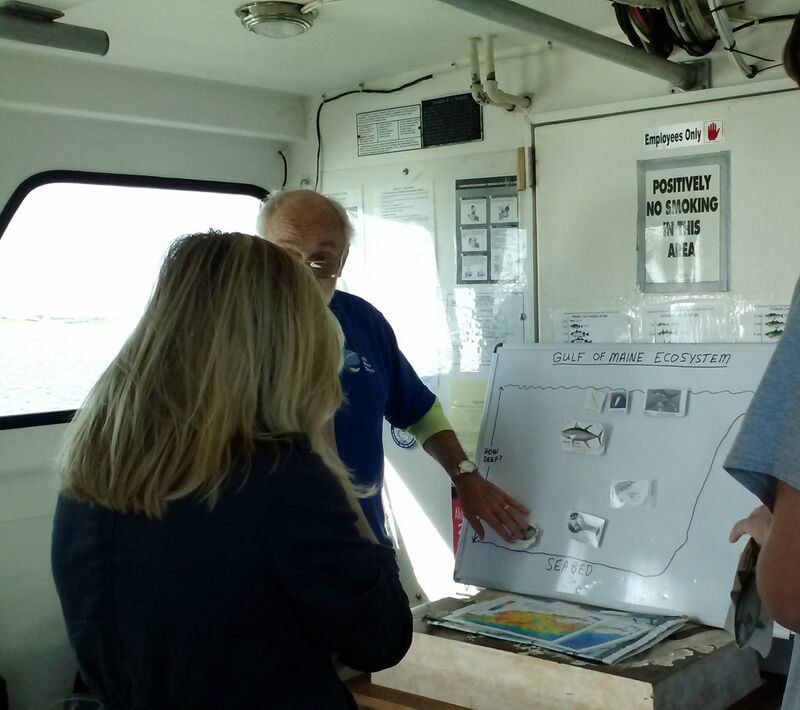 Each station had two marine science docents, so the student-to-teacher ratio was no more than 1:3! This was a wonderful opportunity to get some authentic learning for high school students. We also took advantage of a sandy beach lesson after lunch. Each station is briefly described below. 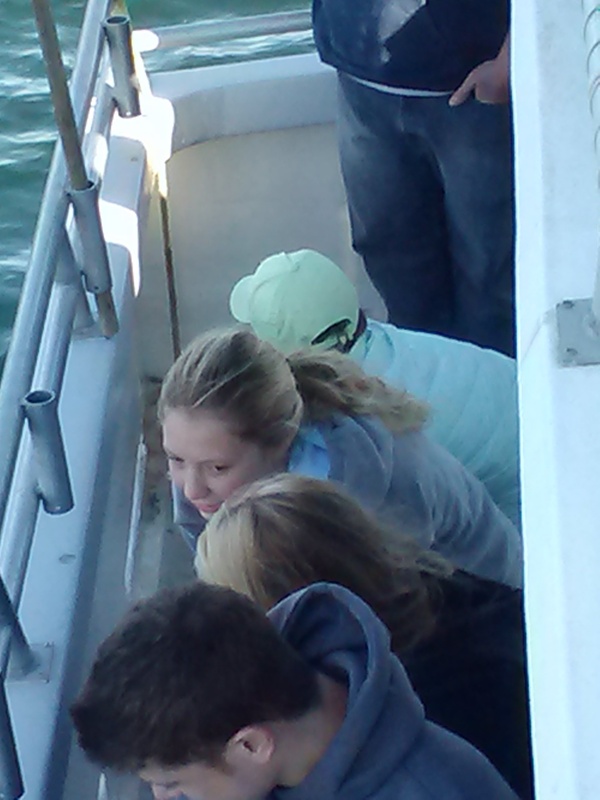 Before any of the activities got underway, we trawled for benthic organisms and the students helped pull up the catch. 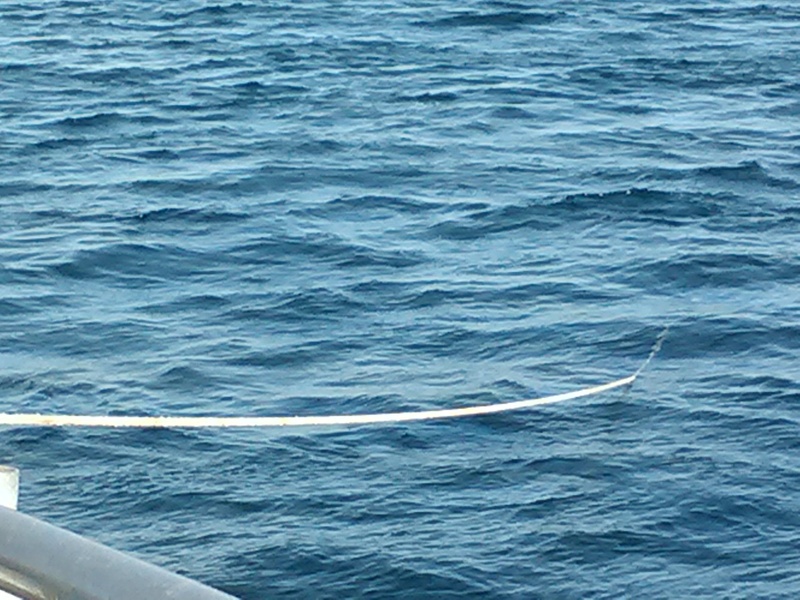 Bottom trawling is a benthic sampling technique that uses a net dragged along the bottom of the water body to collect organisms living there, for further study. The device used in this program is shown in model form in the image below. If has floats on the top of the net and weights on the bottom of the net to keep the net as open as possible. 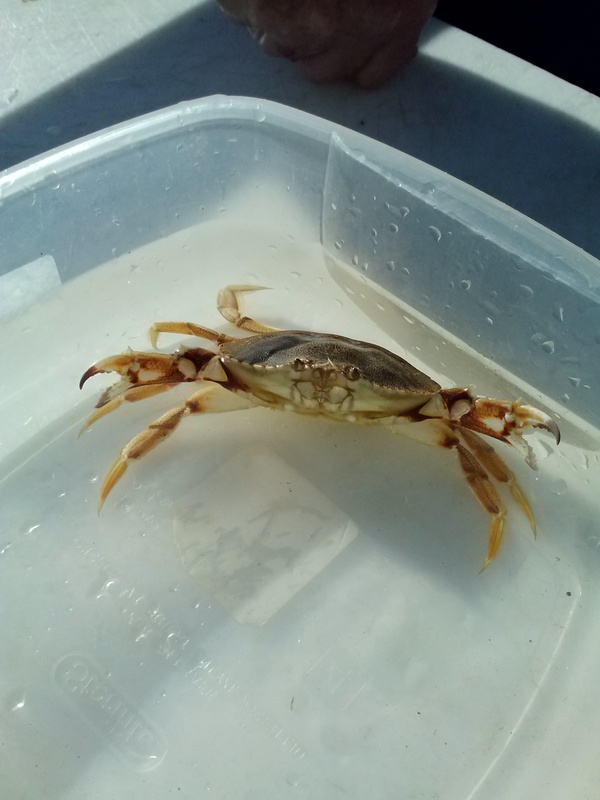 For purposes of scientific study, it provides a “grab” sample of a small area and facilitate habitat mapping studies. Since trawls are destructive in nature, they are not to be used in fragile habitats. 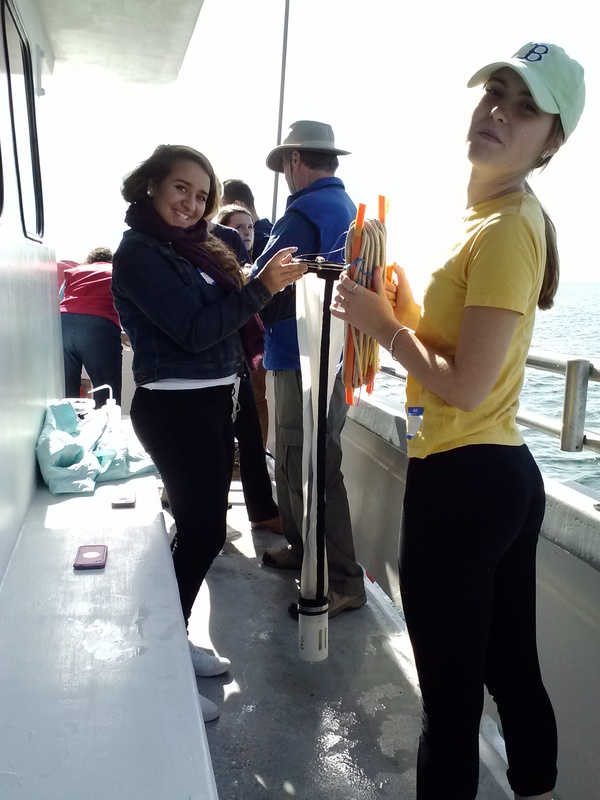 Students line up and grab a piece of the trawl line rope to pu it up. 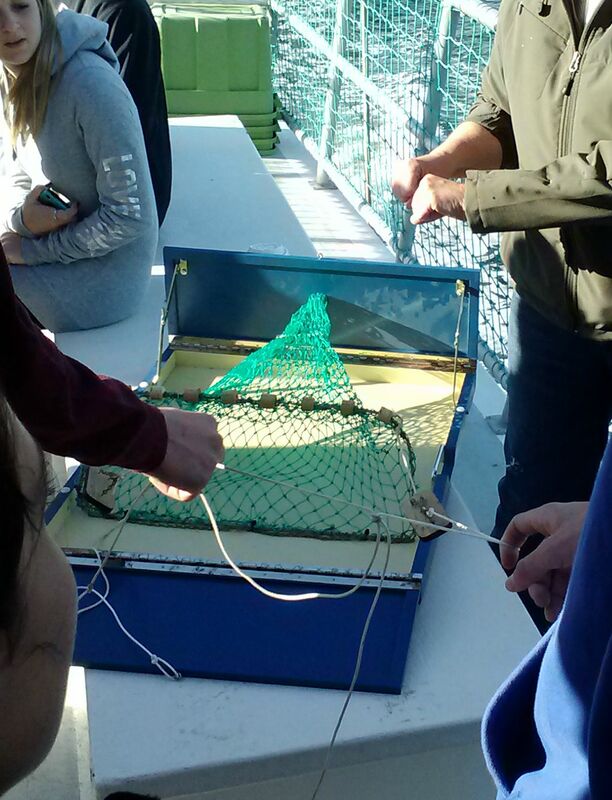 Students used a standard plankton net – and I forget the size mesh – for taking a plankton sample. 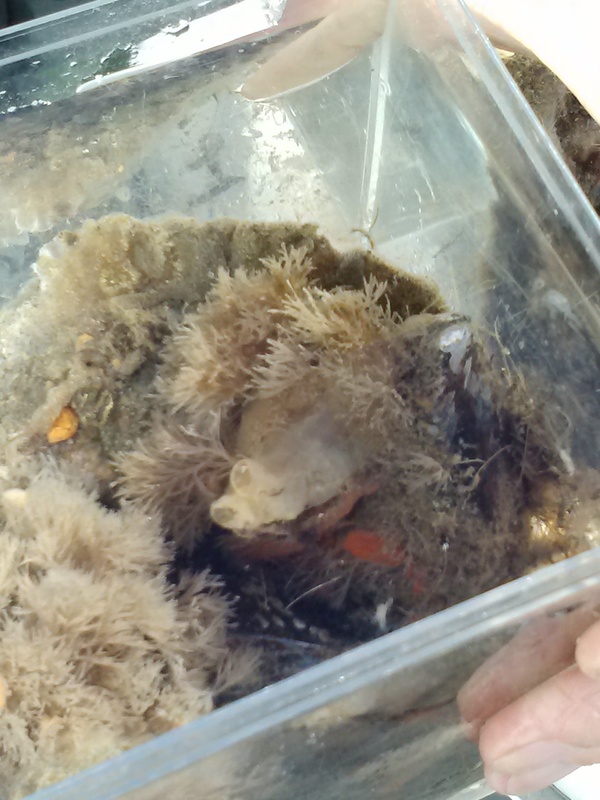 The critters were then rinsed down the mesh and collected in a box, where students could take a sample for viewing. 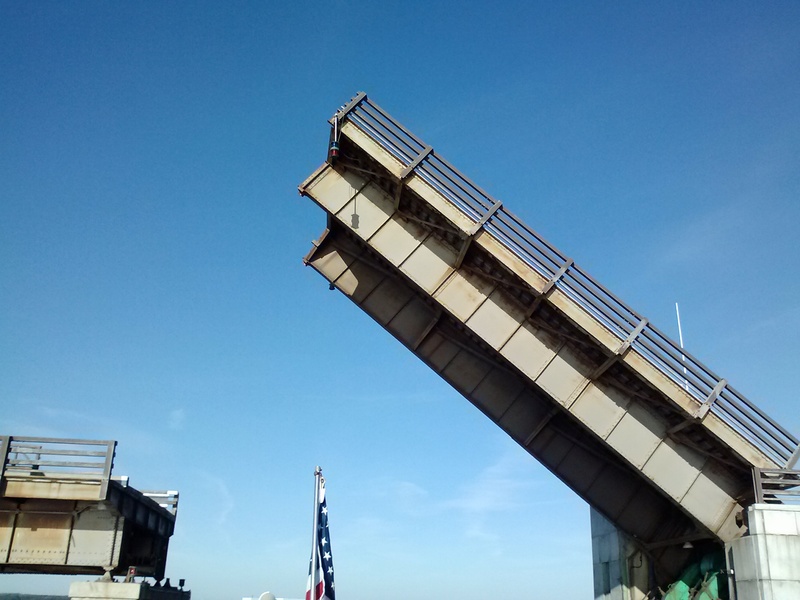 The viewing container, I believe this is a DiscoveryScope, is a little clear rectangular box that fits together. This viewing box then fits onto a frame with a magnifying glass to look through. 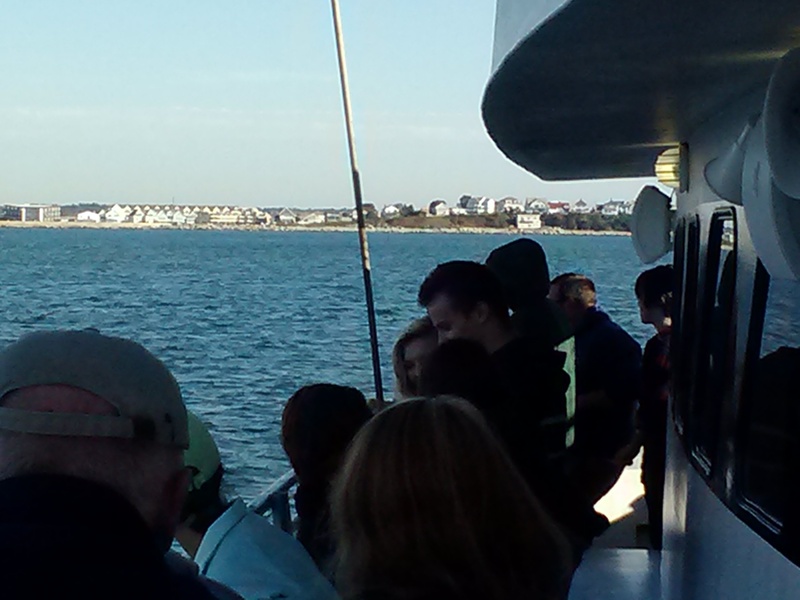 I could not get any pictures through the view box but some of the students were able to. 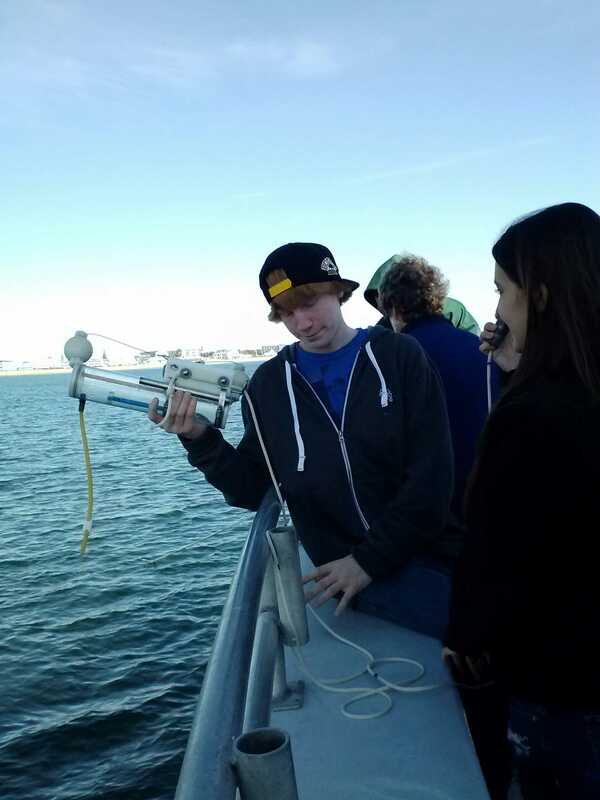 At this station students determined their location in Hampton Harbor using a portion of the marine chart and parallel rulers. 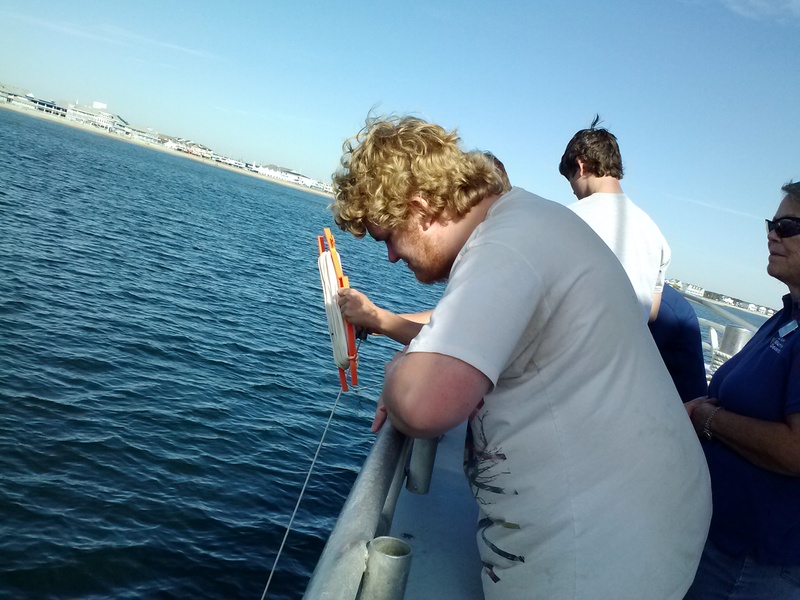 We had tried a similar activity in class, but did not have any parallel rulers, and this – being on the water bobbing around and looking for water towers and high tide lines – gave a more honest representation of how to plot your location. The students also had real compasses, rather than their iPhone compass, which further improved the activity. 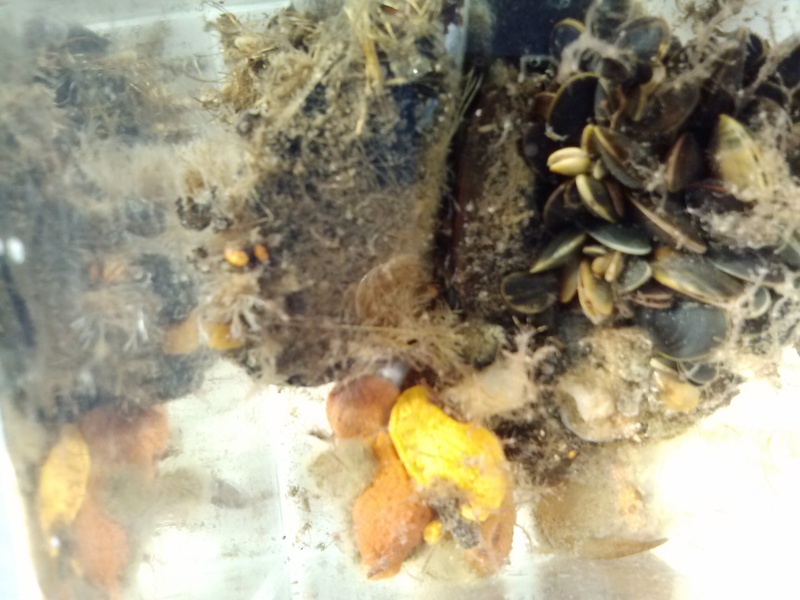 The best way to describe what was pulled from the bottom is to show you the pictures. 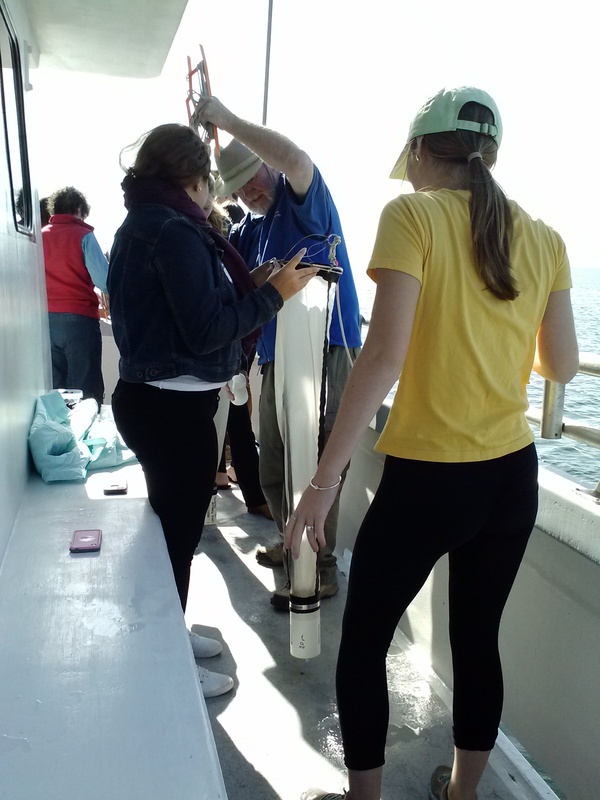 Students setting up a Van Dorn bottle, horizontal water sampler, to take water sample. 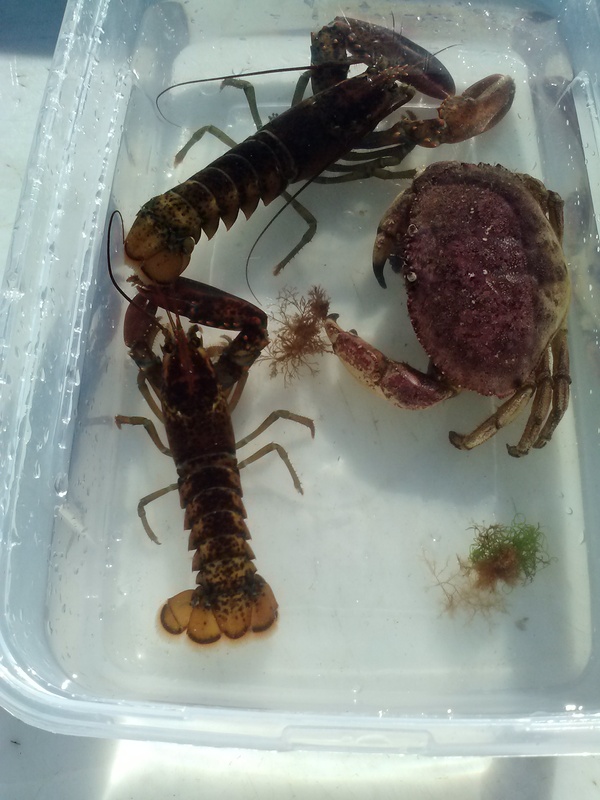 Thinking about what fish use Georges Bank, what they eat, where they live, and their abundance. We had a 45 min break for lunch (yay! beach pizza from Tripoli’s!) 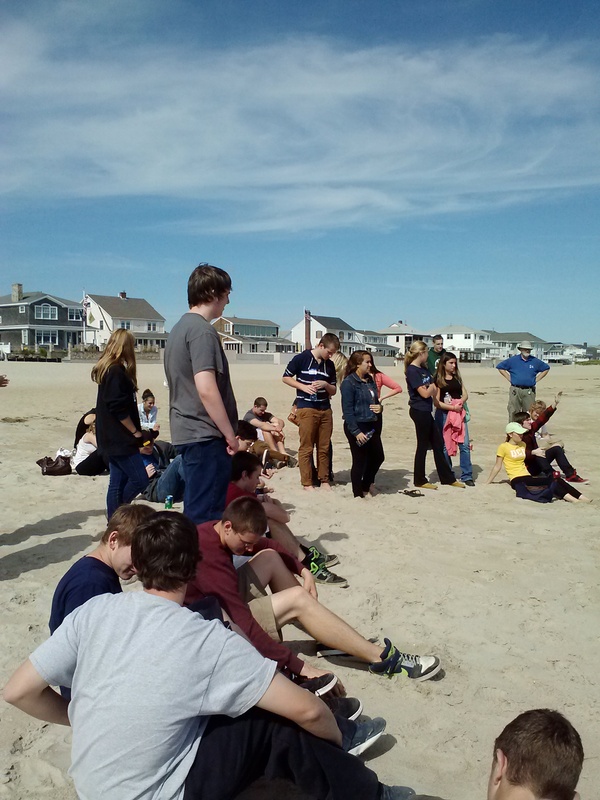 and then one last activity on the beach: How do beaches form? Students examined and compared high, mid, and low-tide sands as well as the wrack line, and made nifty little booklets about what they uncovered. How was your ocean literacy changed? Choosing just one of the floating lab stations, what value did you get from the station? 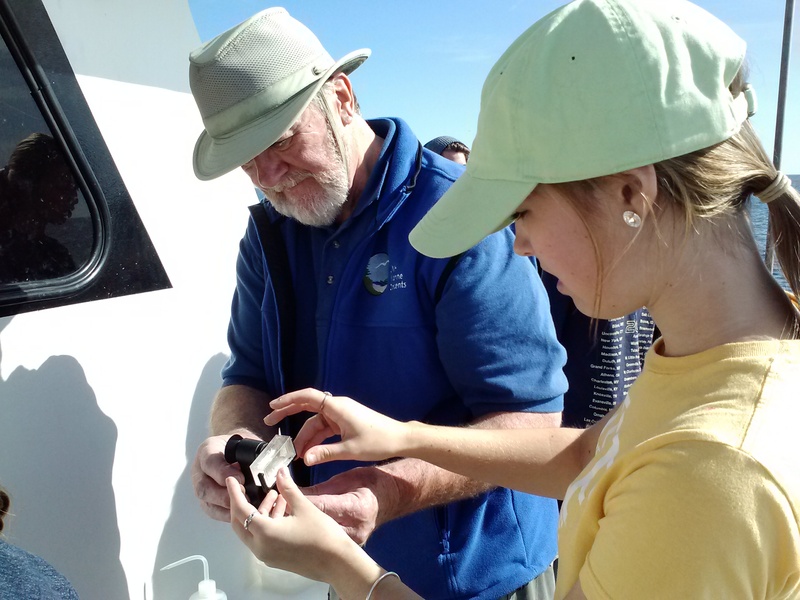 How did this field trip help you understand marine science? 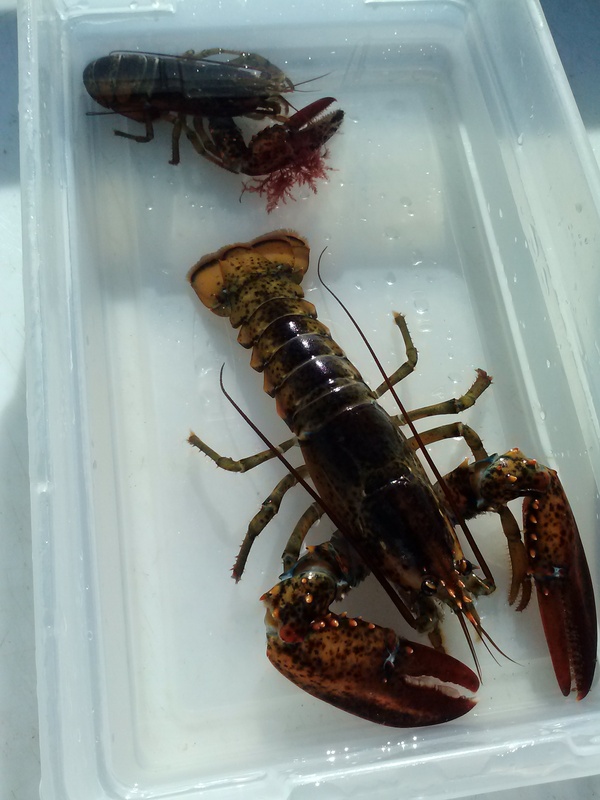 How did the field trip illustrate methods used by scientists in the real marine science investigations? What do you understand better now, as a result of the learning stations? All statements must be supported with evidence (examples), and have follow-up from additional sources (links). The usual two paragraph minimum with a related picture applies. The pictures Ms. Goodrich took are here. It was a good day. The weather was spectacular. The students were engaged in real, honest-to-goodness science practices. And the staff of both Eastman’s and the UNH team were great. 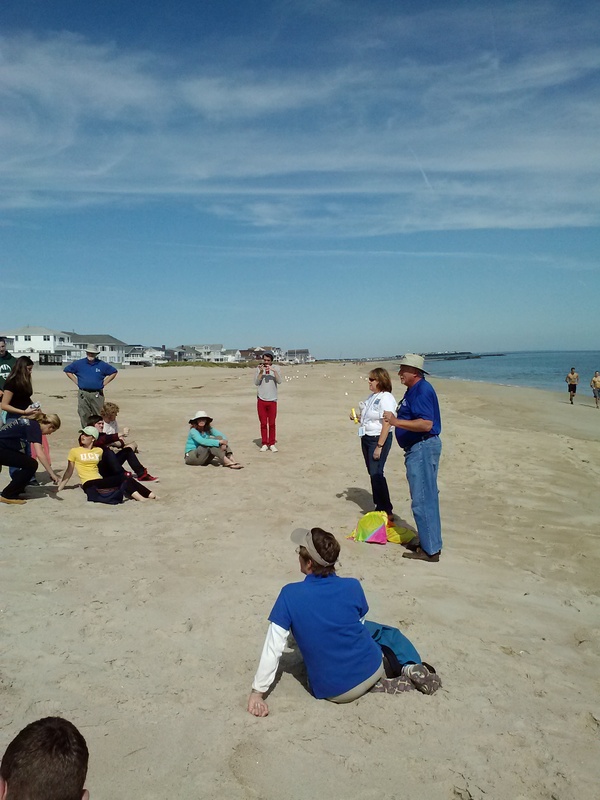 Thanks goes out to Dari Ward at UNH for organizing this wonderful ocean literacy program. 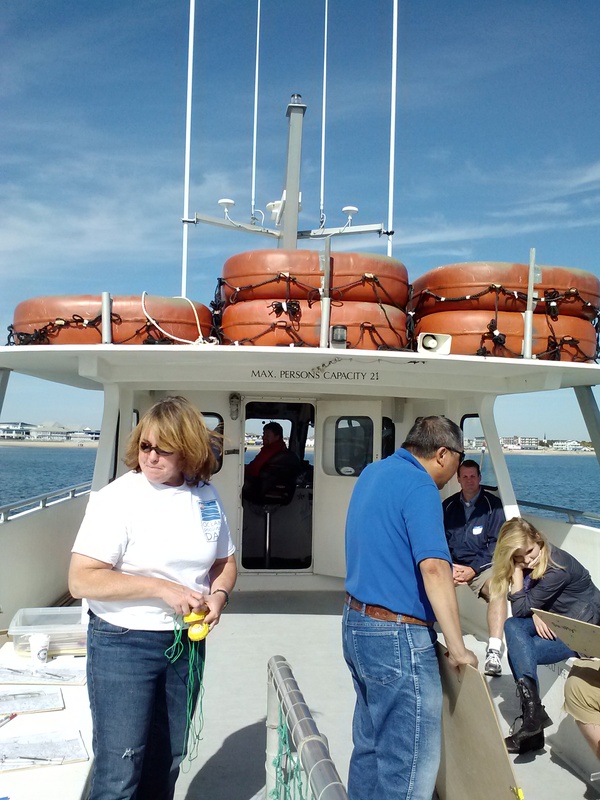 The docents on this field trip were extremely professional, knowledgeable, friendly and experienced. They enhanced the program considerably with these qualities. 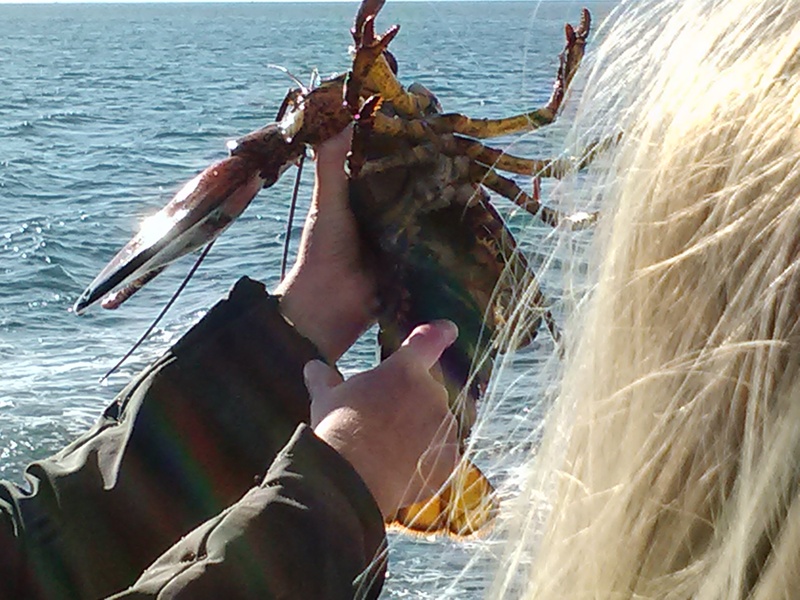 The program itself is funded through a New Hampshire Sea Grant. I will not use any curse words or inappropriate language. I will not use fighting words or provoke anyone. I will not use my full name, or the name of my classmates. Please note that all posts and comments are moderated for content before being published. Content: Topic Specific topics will vary by assignment but must be related to science. Topic is related to school, but not necessarily science. Topic does not relate to science or school. Content: Body Post includes a 1-2 paragraphs. Post is less than 1-2 paragraphs. Post does not include a summary, but includes a URL to an article. Sources Blog post includes a hyperlinked references to additional clarifying information. Blog post includes a URL to additional information, no hyperlinks. References are missing. Images Post includes an image with a caption and is hyperlinked to its original source. Post includes the URL for at least 1 image Post does not include an image. Questions Post includes 2-3 (science-based) questions in your post. Post does not include questions. Tags or Labels Post includes 2-3 labels or tags. Post is unlabeled and untagged.